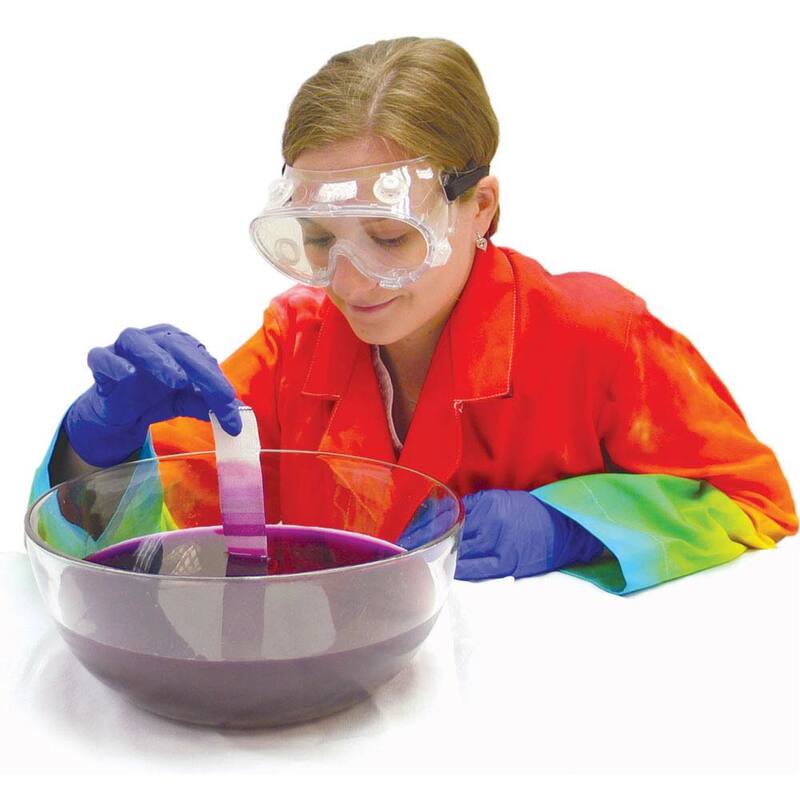 Fabric Identification Kit, Chemistry: Educational Innovations, Inc.
Use dyes to identify unknown pieces of fabric from eight possibilities. 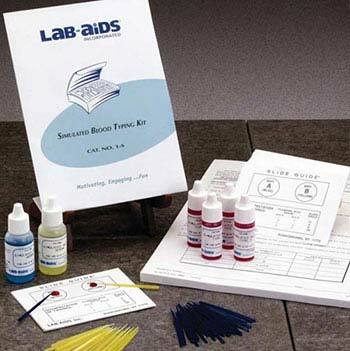 This complete kit allows a class of 15 pairs of students to use dyes to identify unknown pieces of fabric from eight possibilities, as well as to investigate the best fabrics to dye using powdered drink mix. The kit consists of instructions, five feet of Multi-Fiber Ribbon, two Multi-Fiber Dye pellets, three packages of powdered drink mix, and enough material to make 60 unknown fabric samples. This white ribbon consists of eight different fiber strips (cotton, nylon, silk, wool, etc. ), woven together into a single ribbon. It can be used to test different commercial dyes such as Rit and Kool-Aid, as well as natural dyes such as goldenrod and grape juice. Soak a piece of Multi-Fiber Ribbon in a colored dye and note how each of the fabrics is stained differently. Use a strip of the ribbon as a "known" to identify a piece of unknown fabric. 4.5" wide (approx. 11 cm) by one yard long. One yard may be cut into over 60 test strips! Note: If you've used our Multi-Fiber Ribbon prior to the summer of 2015, this ribbon will have a different selection of fabrics. See the enclosed lesson guide for details. This package consists of eight pieces of fabric, each represented in the Multi-Fiber Ribbon. The pieces of cloth, approximately 4" x 12" each can be cut into more than 200 samples of cloth for the students to identify using the multi-fiber dye (SM-6B). 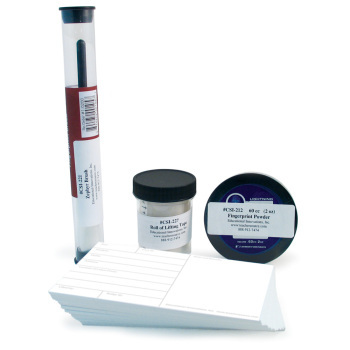 Use these dyes along with our Multi-Fiber Ribbon to identify an unknown swatch of fabric. These incredible dyes stain each of the fibers a different color. Each package contains 10 ready-to-use capsules (5 each of two different dyes). Simply place a capsule in boiling water and soak the multi-fiber ribbon for five minutes. Absolutely amazing! I am not sure that I have purchased the kits, but I have the multi-fabric strip, the dyes, and the unknown fabrics. Preparation is easy! For one of the dyes, you simply add the dye capsule (1) to the hot water. The second dye you add a 2-mL of 10% acetic acid to the hot water with dye capsule (2). Each dye capsule contains a different mixture of dyes. I cut the multi-fabric strip into 1/2 inch wide strips using a paper cutter and cut the unknown fabric of my choice into small squares. The two dyes are poured into separate small plastic cups for each pair of students. They place one multi-fabric strip and one unknown square into dye 1 (cup is labeled "dye 1") and place the other multi-fabric strip and unknown into a small cup containing dye 2. After sitting in the dye for 5 minutes, they pull the strips and squares and rinse in separate tubs of water. They may need to replace the water in order to fully rinse the fabrics. They then match the color of the squares to each of the colored fabric strips and identify the fabric. The hardest part I found was several of the students matched the squares to different fabrics stating the unknown was two different fabrics. With some guidance, the students soon realized it had to be the same fabric and were able to identify the unknown. I found that the dyes kept for about a week so I could use them with several different groups of students and I could also change the identity of the unknown fabric. With the labeled cups, my assistants could place the appropriate cups of dye into the larger beakers they came from. The beakers of each dye were then covered with plastic wrap after cooling and reheated when the next group was ready to perform the activity (remove the plastic wrap of course). Eventually, the dyes would no longer work as they were designed. I found using small amounts of bleach would oxidize the dyes to a near colorless liquid and then disposed of. The beakers and small cups could be rinsed out and used again, year after year. Dispose of the oxidized dye in the beakers according to your local regulations. 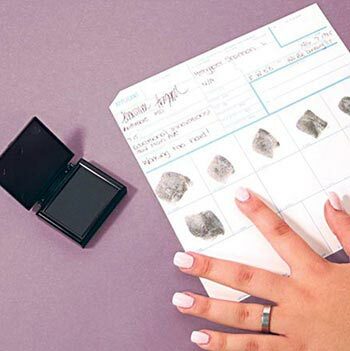 I have used this activity as a larger part of the CSI chemical forensics program again and again. 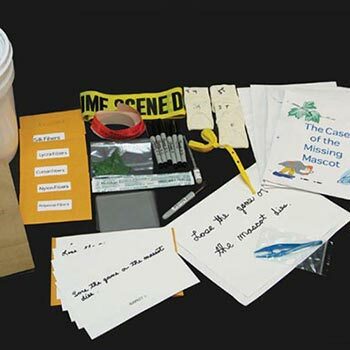 The kids enjoy the investigation and using the results of their work to identify the likely perpetrator of the crime. The kids enjoy doing the activities. It takes them 2-hours to complete all the activities. For second grade students, this is remarkable. The only complaint year after year is that they are hungry! I highly recommend this product.